We have legislated so experimentation is only permitted when there is no alternative research technique and the expected benefits outweigh any possible adverse effects. Three licences must be granted by the government before an experiment can take place: a personal licence for the individual doing the experiment, a project licence for each experiment and an establishment licence for the institution undertaking the experiment. Licences are granted for medical, veterinary, scientific and environmental research. Dogs, cats, monkeys and horses have special protections, meaning they can only be used if no other animals, such as a mouse or fish, will suffice. Together, they were used in less than 0.5% of experiments in 2013. The UK has two tiers of regulation: local and national. Projects must be approved by an institution’s Animal Welfare and Ethical Review Body (AWERB), who will also advise the principal investigator on matters relating to animal welfare and the 3Rs. The project must then be approved by by the Home Office, who will carry out a harm/benefit analysis to assess whether the expected benefits outweigh any possible adverse effects to the animal. The work of the Home Office in processing applications and inspecting animal facilities is scrutinised by the Animals in Science Committee, which is made up of a diverse membership including scientists, animal advocates, lay persons and a vet. Most research in the UK is conducted in Universities and medical schools, and focuses on discovering how biological systems operate rather than testing pharmaceuticals. More than half of experiments licensed in 2013 were connected to the breeding of genetically manipulated mice, such as breeding deaf mice to understand the role of genes in deafness. Every year the government publishes comprehensive statistics on the use of animals in research. These include the number of animals used, the number of procedures, the types of research, the numbers of genetically modified animals, and the types of anaesthetic used (and much more), with each table broken down by species. See these statistics. In 2013, EU Directive 2010/63 was transposed into UK law, resulting in small but important changes into ASPA, 1986. These included the introduction of lay summaries and retrospective assessments of animal suffering. There have been special controls on the use of laboratory animals in the UK since 1876. Before 1876, there were general laws protecting animals since 1822. The 1876 Cruelty To Animals Act also granted additional protections for cats, dogs, monkeys and horses, stating that they were not to be used if another animal, such as a mouse, could be used in their place. From that time, researchers needed a licence from the Home Office to conduct experiments. 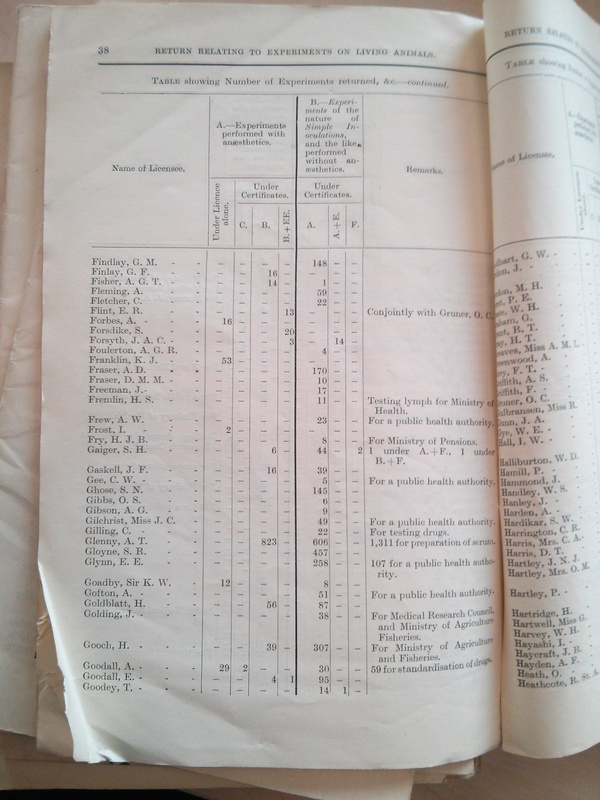 From 1877 the Home Office published the names and addresses of the researchers along with a record of how many animals of which species were used in which area of research. The Home Office still publishes these annual returns but no longer names researchers. An extract from the “Return showing the number of experiments on living animals during the year 1922” which shows the Nobel Laureate, Alexander Fleming, used 59 animals in licensed procedures over the course of the year. Click to see whole page. [A]ny procedure applied to a protected animal for a qualifying purpose which may have the effect of causing the animal a level of pain, suffering, distress or lasting harm equivalent to, or higher than, that caused by the introduction of a needle in accordance with good veterinary practice. The strict requirements of ASPA were translated into European Directive 2010/63/EU on the Protection of Animals used for Scientific Purposes, which came into effect on January 1st 2013. The Directive aimed to export the UK’s high standards across the EU. The UK also saw some small changes as the 1986 law as updated, so draft guidance on the operation of ASPA was published on 29 January 2013. Among the changes, there is now explit reference to the 3Rs as well as how experimental severity is reported. The draft guidance explains what amended ASPA requires and provides detailed guidance to holders of establishment licences, project licences and personal licences and new licence applicants. It also provides guidance on how to classify the severity of an experiment and what constitutes humane killing. research premises have the necessary facilities to look after the animals properly (as laid down in a Home Office Code of Practice). In addition, a new level of regulation took effect in April 1999, with the introduction of local ethical review. In most countries, the regulation of animal research operates either through local ethical committees or by statutory controls imposed by central government. The UK is the only country in the world to have both systems operating at the same time. 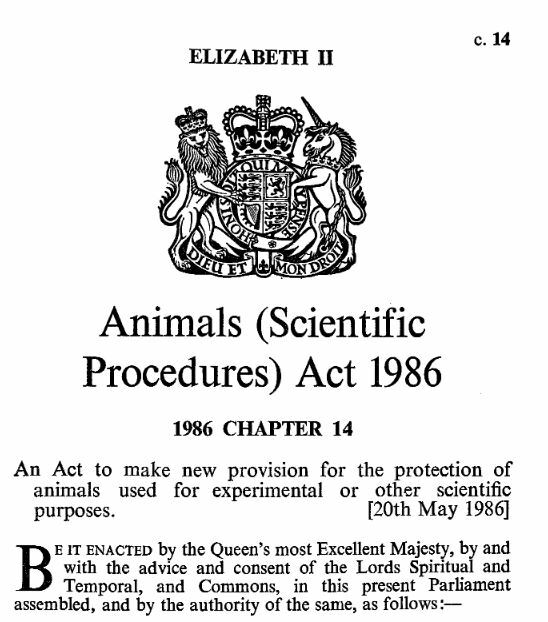 The Animals in Science Committee is further responsible for providing impartial, balanced and objective advice to the Secretary of State, to animal welfare bodies and within the European Union on issues relating to the Animals (Scientific Procedures) Act 1986 as amended. by exchanging information within the European Union to co-ordinate best practice. All cosmetics testing is outlawed in the UK, and a Europe-wide ban on testing cosmetics or their ingredients, or importing such cosmetics came into effect in 2013. There is a complete ban on using great apes, such as gorillas or chimpanzees. New products often have to undergo a range of different tests to meet the requirements of regulatory authorities in different countries. Efforts are being made to harmonise requirements, which should lead to further reductions in laboratory animal use. The Home Office website has further detailed information.